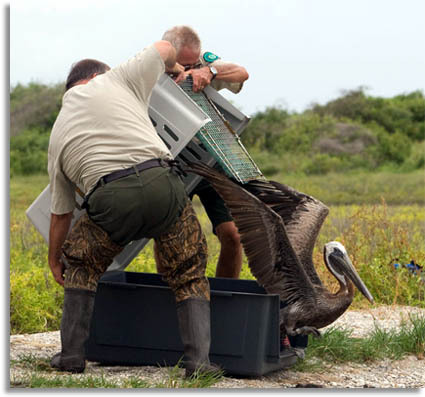 Austin, Texas – Twenty wild brown pelicans rehabilitated after exposure to the BP oil spill were transported from Louisiana by plane and released at Goose Island State Park near Rockport around 12:30 p.m. today, the first release of spill-rehabbed birds at a Texas state park. Birds rescued after being oiled in the Gulf Coast region are rehabilitated and released in Gulf states after wildlife veterinarians determine they are sufficiently prepared to re-enter their natural habitats. Today’s bird release included 16 brown pelicans from Louisiana and four from Mississippi. The release was a joint effort involving the U.S. Fish and Wildlife Service, U.S. Coast Guard, wildlife veterinarians and rehabilitation specialists, and Texas Parks and Wildlife Department. The pelicans were released one at a time on a shell beach on the north end of Goose Island, a small section of barrier island just off the mainland. As each bird flew out from its transportation carrier, they congregated in the bay a few hundred feet offshore, where they appeared to preen and clean their feathers in a group for several minutes before eventually flying away. Goose Island State Park has a resident flock of brown pelicans, so authorities know the area provides suitable habitat for the birds. Last November, the brown pelican was removed from the federal endangered species list, nearly 40 years after it was brought to the brink of extinction by DDT. Although more numerous today than when originally listed, bird numbers are still low, and officials say the available habitat on the Texas coast has plenty of carrying capacity to sustain the released birds.